1. Preheat the oven to 200˚C, gas mark 6; line 10 holes of a 12-hole muffin tin with cases (leave 2 of the middle ones empty). Put the fl our, baking powder, poppy seeds, salt and 75g sugar in a bowl and stir together. 2. In a jug, beat together the yogurt and milk, then whisk in the egg, lemon zest and juice and vanilla extract. Stir in the melted spread, then mix into the dry ingredients until just combined. 3. Put a small spoonful of mixture into each muffin case. 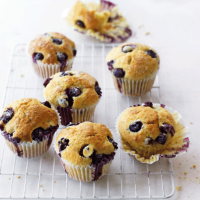 Stir the blueberries through the remaining muffin mixture and spoon into the cases. Scatter over the extra sugar, then bake for 25-30 minutes until just golden. Leave in the tin for 10 minutes before transferring to a wire rack to cool completely. If you don’t have muffin cases, cut squares of parchment about 12cm x 12cm and fold into the holes of the muffin tin. This recipe was first published in Thu May 31 16:04:01 BST 2018.